ICTS engineers are currently investigating a problem affecting the voice quality of some calls made via the Skype for Business unified communication platform. We are working together with our vendor to address this issue. There is currently a South African Revenue Services (SARS) phishing attack doing the rounds on campus. Emails entitled “SARS eFiling” are being sent by various @sun.ac.za email addresses asking you to login to your eFiling account to view an EMP Statement of Account. The UCT Computer Security Incident Response Team have put the necessary security measures in place, and have blocked the links. Additionally, the UCT CSIRT team has been in contact with Stellenbosch University’s CSIRT to inform them of the phishing attack, and they are taking steps to stop it from happening. If you did click the attachment in the email, DO NOT enter your details on the page. Instead, please close the page and run a full antivirus scan of your machine. Then, on a device that you know to be free of malware and infection, change your SARS eFiling password. On a device that you know to be free of malware and infection, change your SARS eFiling password. Inform SARS about this phishing attack and that you have provided your details. In recent days, media outlets have been reporting on the Belarus shame scam in which cybercriminals target individuals – asking them to pay a hefty ransom fee to avoid “compromising” personal information being made public. A potential victim receives an email, WhatsApp, or Facebook message from a cybercriminal. The message claims that the criminal used malware to get incriminating or embarrassing information about the victim. If the victim doesn’t immediately pay a ransom fee, the criminal threatens to publish the information online, or share the information with the victim’s contacts. To make the scam seem even more legitimate, the criminal includes the victim’s username and password for an online account. In actual fact, they have taken these login details from a previous security breach – where the victim’s account has been compromised. That account might not even be used by the victim anymore. These kinds of attacks are becoming more common in South Africa, so it’s crucial to always remain vigilant. One of the most important ways you can protect yourself from such attacks is to use a different password for each of your accounts. That way, if one account is compromised, the others will remain secure. You can use a password manager to help you remember your passwords. Don't reply to spammers asking them to remove you from their mailing list. By replying, you are confirming your email address as valid and will only encourage more spam. There are currently several phishing attacks doing the rounds on campus. An email titled “Validate your Email” claims that you need to upgrade your Office365 email now, to avoid your account from being terminated. A different attack is titled “Current Results Notification”, and claims to be a newsletter with updates about last semester's exams. A different variation is titled "REMINDER: UCT GRANT APPLICATION". After clicking the link, you are taken to a web page which asks you to enter your UCT credentials. If you did click the attachment in the email, DO NOT enter your details on the page. Instead, please close the page and run a full antivirus scan of your machine. Then, on a device that you know to be free of malware and infection, change your password. On a device that you know to be free of malware and infection, change your password. Please check the announcements on the ICTS and CSIRT websites for the latest alerts. If your suspicious email differs to the one in the announcement, please report it to the CSIRT at csirt@uct.ac.za. You can also report any other cybersecurity issues to the same address. As part of the UCT Network Renewal project, several services will be unavailable this weekend. ICTS's regular maintenance slot will also be in effect this Sunday. Please plan ahead so that you can minimise any inconvenience. For example, if you rely solely on eduroam for internet access, please arrange alternate connectivity – such as mobile data. Going forward, please review the schedule of work so that you have an idea of further interruptions that may occur in the coming months. We thank you for your patience and understanding as we undertake this crucial project to improve network performance and equip UCT to meet the challenges of the coming years. We are aware of a new malware attack currently doing the rounds on campus. This attack usually comes from a Gmail address, and could be entitled Receipt for payment or something similar. When you open the attachment, a blank screen is shown. You won’t immediately see any result, and you won’t be asked to enter any details – but malicious code will begin running in the background. The UCT Computer Security Incident Response Team (CSIRT) is working together with our service provider to put the necessary security measures in place to prevent further spreading of this message. Send an email to the UCT Cybersecurity Incident Response Team, informing them that you received this email. Delete the message from your Inbox, then delete it from your Deleted Items folder. Disconnect your computer / device from the UCT network. You could shut down the computer, pull out the network cable (if you’re on a wired connection), or disable wireless communication (if you’re using WiFi). Using a device that you know to be free of malware and infection, immediately change your UCT password using Password Self-Service. Send an email to the UCT Cybersecurity Incident Response Team informing them that you have opened the attachment, but that you have disconnected the compromised computer / device, and changed your UCT password. Report any incidence of this or other phishing attacks of cyber security issues to the UCT CSIRT at uctcsirt@uct.ac.za. You can also report any other cybersecurity issues to the same address. As part of the UCT Network Renewal project, some services will be unavailable this Sunday. There is currently a malware attack doing the rounds on campus. This attack, which contains a malicious attachment, specifically targets staff and student email accounts. 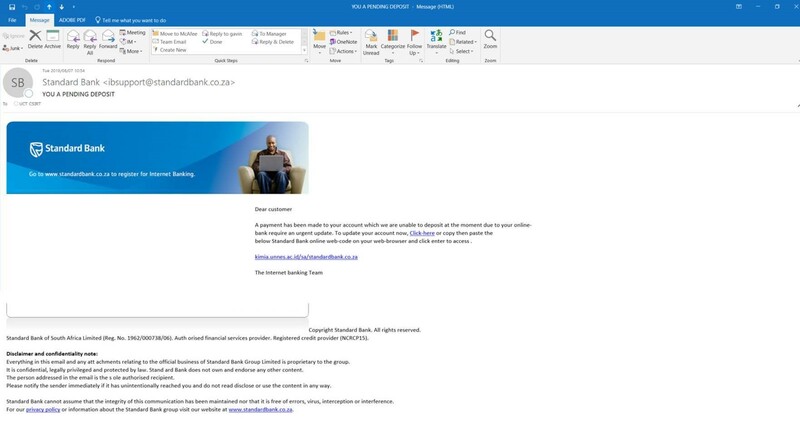 Upon clicking on the attachment, you are redirected to a malware site, pretending to be Microsoft OneDrive, where your UCT credentials may be compromised. The UCT Computer Security Incident Response Team (CSIRT) has blocked the account to prevent further spreading of the message. If you did click the attachment in the email, DO NOT enter your details on the page. Instead, please close the attachment and run a full antivirus scan of your machine. Then, on a device that you know to be free of malware and infection, change your password. The UCT Computer Security Incident Response Team (CSIRT) is aware of a phishing email that has been sent to some UCT staff members indicating that their lives are at risk. The necessary security measures have been put in place to block this sender, and to prevent any replies from being sent to this email address. We take these sort of phishing emails very seriously and will be conducting the necessary investigations. If you receive any future suspicious emails, please forward them to uctcsirt@uct.ac.za.